Previously, we took a look at the formation of the all-new, all diverse team of X-Men. 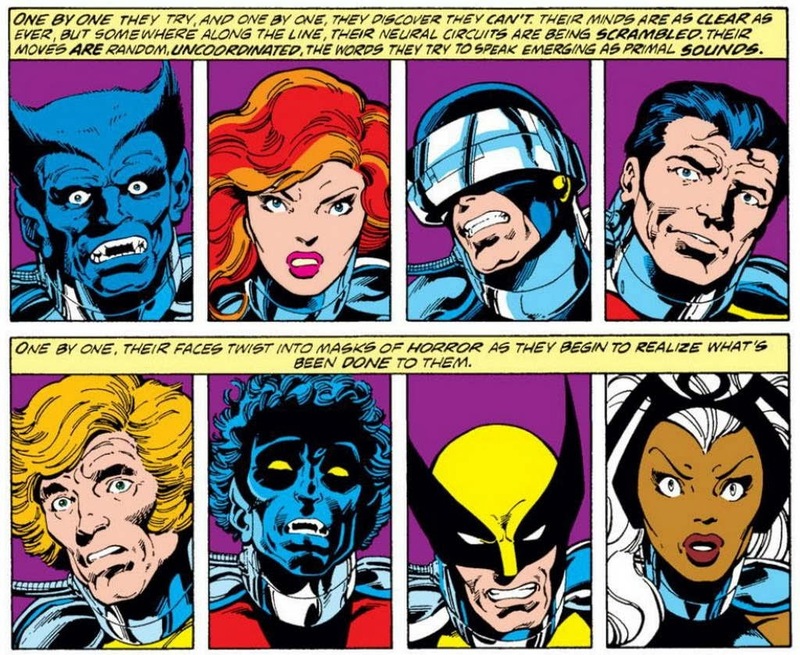 Created by Len Wein with art by Dave Cockrum, writing duties were quickly handed over to Chris Claremont, in the newly revived X-Men title. The X-Men became involved in a galactic civil war that threatened the very fabric of existence, but overcame it all because Jean Grey is perfection. Xavier is in love the the princess that spearheaded the rebellion, and John Byrne has taken over as the regular penciler of the book. As I’ve said before, my sole purpose for covering these comics is to force the X-Men on Duy, who has refused to read X-Men comics because he thinks they’re too diverse. Enough preamble, let’s pop this mutant popcorn of love! The X-Men finally arrive back home, with Wolverine wasting no time in getting out of that ridiculous Timberwolf costume. Banshee wastes no time in letting Moira know just how he feels about her, with a big ole kiss. Storm heads up to the attic to get naked and water her plants. Jean and her parents leave to have a talk, but not before Jean can flash back on the recent events, including how she promised Corsair not to tell Scott that he is his father. Scott, feeling scared and vulnerable, decides to talk it out with his brother, but Alex and Lorna left for Moira’s island, to get some time to themselves. Nightcrawler is upstairs in his “film buff’s idea of heaven” room, setting up a date with Amanda. 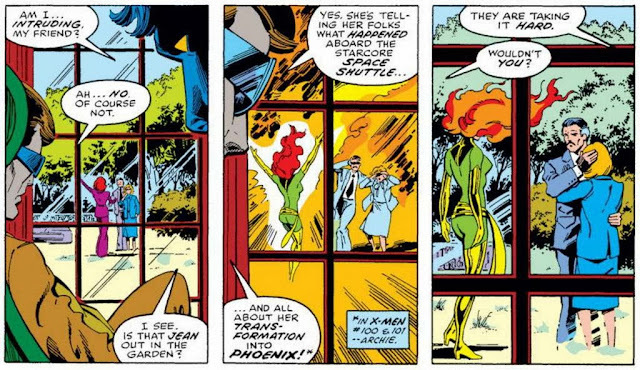 The only thing that could be sadder than that, is Cyclops sitting alone in a dark room (I guess he can’t tell if it’s dark though) staring out the window at Jean explaining to her parents about her transformation into Phoenix. Scott starts talking about how hard and unfair life is… to the furry blue guy that looks like a demon. Nightcrawler tries to give him some much-needed perspective. Banshee prepares to head out with a growing group of people on their picnic, when Wolverine shows up to tag along, if only so he can go hunting, much to Storm’s misjudging consternation. Over at the picnic, everyone is having a grand ole time. 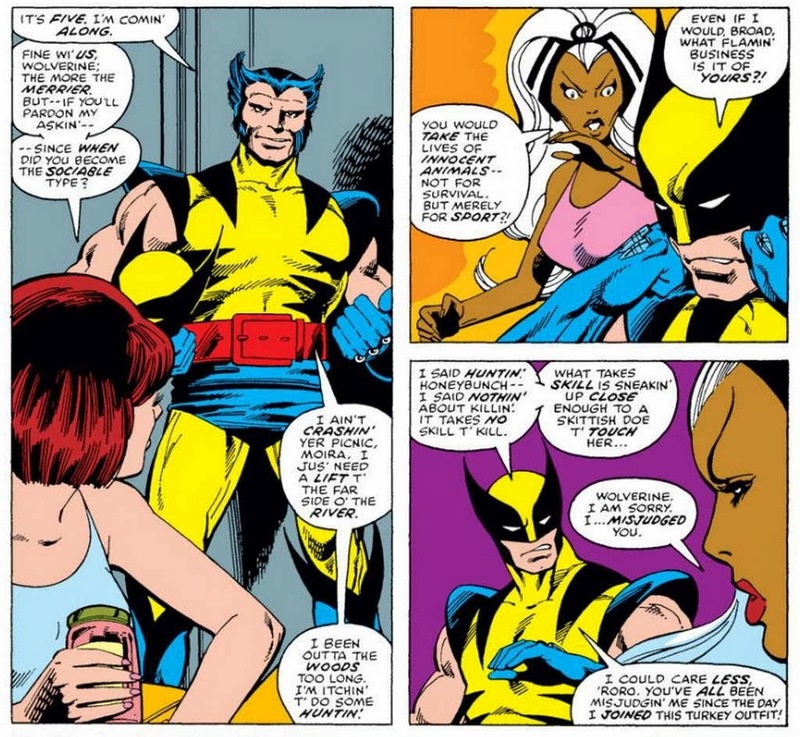 Storm is lamenting the fact that she can’t be naked all the time, and Colossus is telling her about his homeland, when Wolverine comes flying in, crashing into a tree. 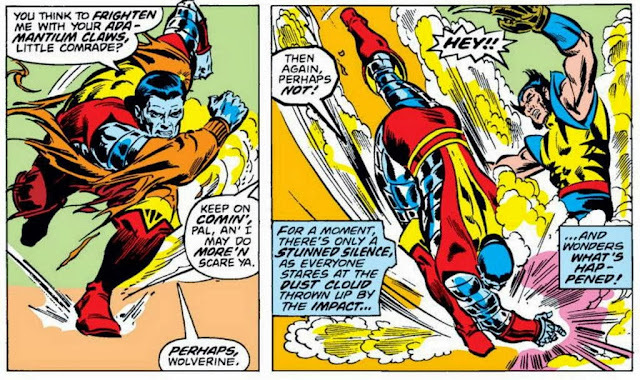 Wolverine is unconscious, and Colossus prepares to face off against his attacker, Weapon Alpha. Colossus and Storm take it to Weapon Alpha. He responds back with an energy bolt that ricochets off Colossus’s armored body, and glances across Moira’s head. Banshee, now in a rage, hurls himself at Weapon Alpha with the full extent of his sonic powers. Weapon Alpha, wanting no part of that, retreats quickly, promising to himself to bring Alpha Flight along with him next time. 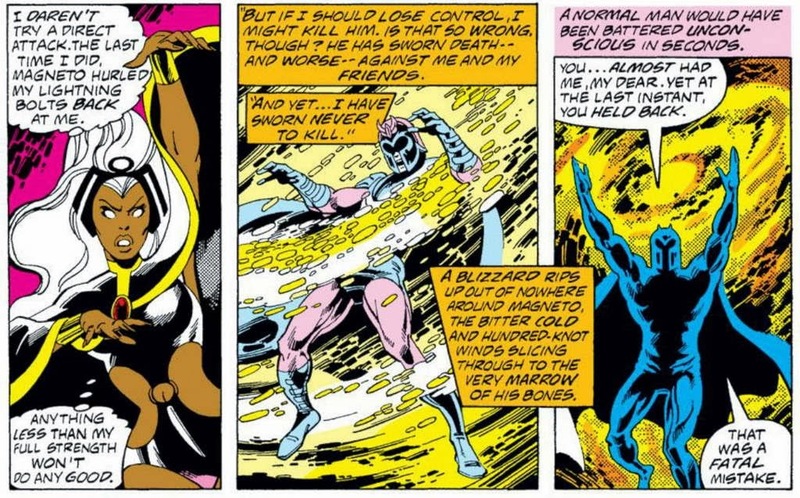 Storm and Banshee search for him briefly, and then return to the injured Moira. Colossus asks Wolverine why that man was after him, and he ominously replies that this is only the beginning. My brain thoughts: I’m going to show my clear bias at this point, but I feel like this is when the X-Men I loved and remembered truly began. No cosmic space missions, they’re just hanging out at the mansion, doing their own things, when trouble comes and finds them. Byrne hasn’t quite hit the height of his abilities yet, but together with Austin, there was no one else really on his level even at that time. And I just really dig Alpha Flight for no good reason. 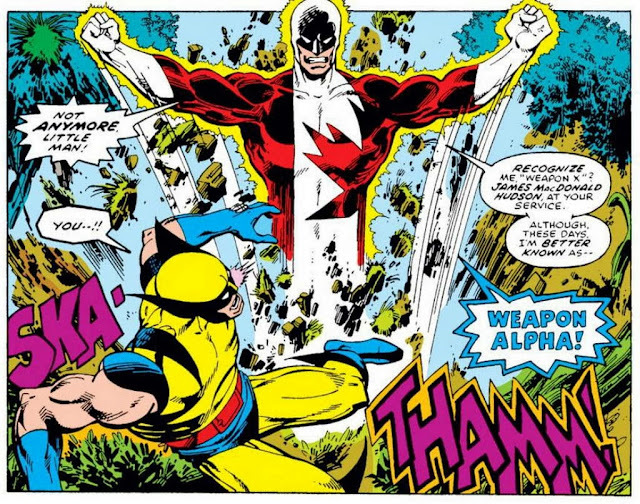 The impact of Byrne (from Canada), who was determined to put more focus on the (Canadian) character Wolverine, is almost immediate. The X-Men are enjoying a nice relaxing game of softball, which quickly gets way too serious between Colossus and Wolverine. 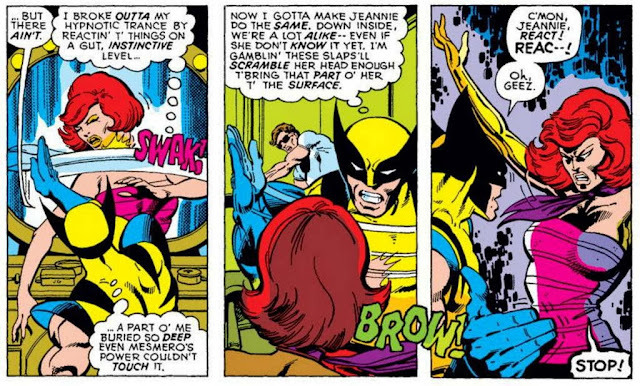 Jean tries to calm Wolverine down, and he continues to pine for her in secret. A villain by the name of Warhawk poses as a telephone repairman, to gain access to the mansion and ambush Moira. While the team prepares to practice in the Danger Room, Warhawk ambushes Xavier and Phoenix. Inside the Danger Room, Warhawk traps the team inside, and turns the game deadly. 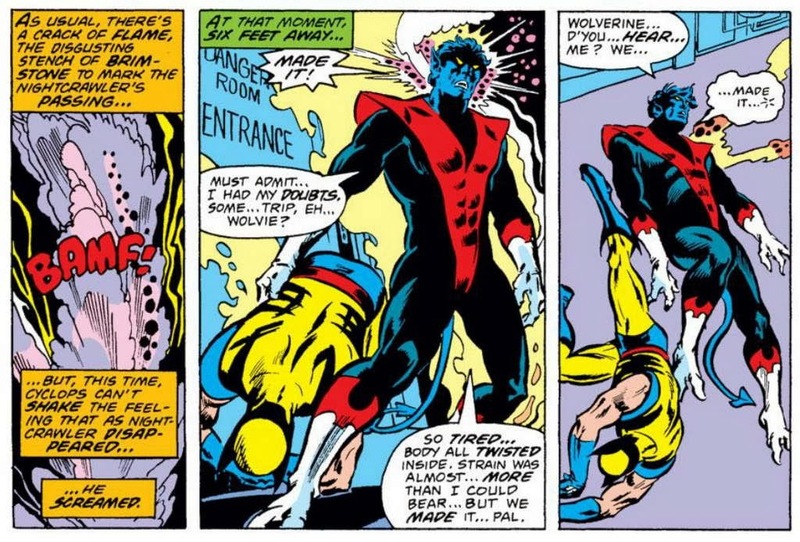 Cyclops has Nightcrawler teleport outside of the Danger Room to try and find a way to get them out, and has him take Wolverine with him (marking the second time he teleports with someone else). Wolverine slashes the controls to the room, and then takes on Warhawk one on one. The rest of the team quickly joins the fight, and they easily take out Warhawk. Concerned about how easily Warhawk was able to take her out of the fight, Jean changes her mind about leaving the X-Men, and decides to rejoin the team. My brain thoughts: This is the second fill-in issue, and according to the letters pages, it seemed like it was published because they didn’t want to waste the material before they launched full-on into the John Byrne era. They were probably also trying to get the X-Men on a monthly schedule (which is the reason Cockrum ended up leaving the book, from what I remember). As far as fill-in issues go, this wasn’t a bad one, and they were able to add enough dialogue to make it fit in with the momentum of the previous issues. The Beast, former X-Men team founder, and current Avenger, has come to a Texas carnival in search of the X-Men. He finds them, but they are not quite themselves. Beast thinks the carnival acts are the new X-Men, but having not formally met them yet, he can’t be sure. He flashes back to recent events. A frantic Lorna had called when Alex went missing, and the X-Men weren’t answering calls. Beast went to the mansion to investigate, and found it empty, as if everyone had disappeared in the middle of a meal. He used Cerebro to track them to his traveling carnival. 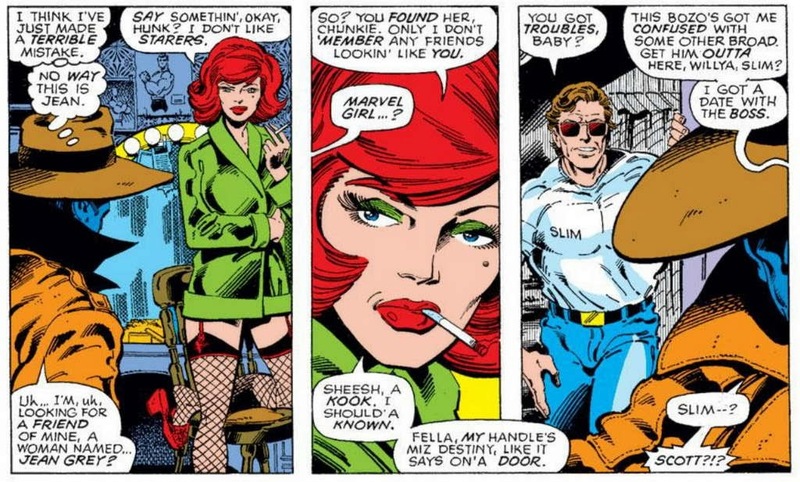 Beast is pretty convinced that the trapeze act is Jean Grey, but when he follows her back to her trailer, she doesn’t seem to know him at all. Cyclops, going by the name Slim, doesn’t remember him either, and when the Beast’s appearance is suddenly revealed by the removal of the all-concealing hat and coat, they freak out and call for help. Help which includes a clown, which is excellent. Beast escapes and hides out in a tent, where he deduces that someone may have messed with the X-Men’s minds (which already makes him the smartest character in the book over the last however many issues, for figuring out the obvious). 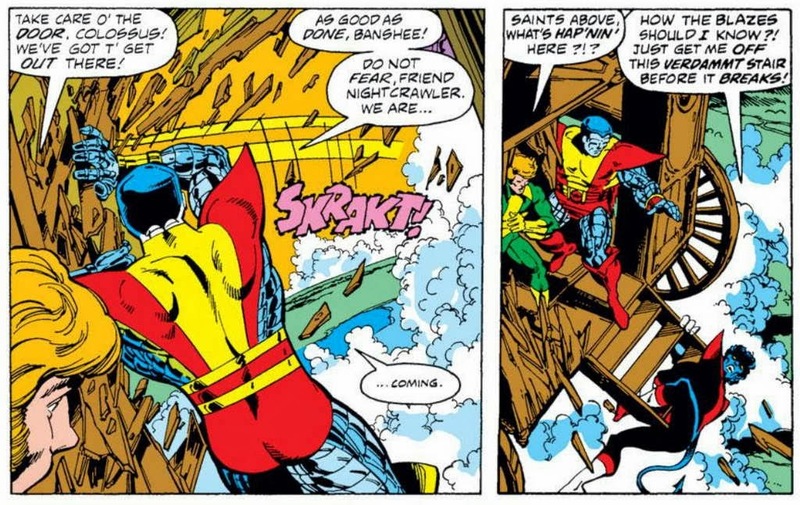 He takes a sudden Colossus punch to the back of the head though, and is too shaken up to avoid being captured at that point. Wolverine struggles against his chains, almost as if he remembers the truth. Beast is dragged over to the wagon of the big boss, who is revealed to be Mesmero. He prepares to use his powers to enthrall the mind of the Beast, just as he did the X-Men. Over in his tent, Wolverine struggles mightily against his chains, and finally heroically breaks free. He seems to be the only one that was able to overcome the mind control, and he goes looking for answers. After threatening a carnival worker for some answers, Wolverine goes busting into Jean’s spot, and tries to break her free of the mind control. When words won’t work, he reluctantly starts slapping her around. It works, and after an initial push-back of rage and fury, she snaps back to herself and they prepare to save the day. In Mesmero’s wagon ( I just love typing Mesmero’s wagon), the Beast continues to resist his hypnotic powers. A worker busts in to warn him that the X-Men have broken free. Beast makes a move toward Mesmero, but is felled from behind by a mysterious figure. The X-Men, restored to normal by Jean’s psychic powers, make quick work of the carnival riff-raff on their way to confront Mesmero. They enter his wagon, and find the Beast unconscious on the floor. Mesmero, at first standing, collapses forward right on top of the Beast, unconscious as well. The mysterious figure calls to them from the back of the darkened room. A figure revealed to be their greatest enemy, Magneto. My brain thoughts: This is what I’m looking for in my X-Men stories. They may not be as large in scale as fighting for the survival of the universe, but somehow the smaller stakes give the story more time to breathe. We get more time to spend with the characters, in each of their own personal little worlds, and that makes their struggles that much more important to us. Plus, the guys in the ridiculous purple costumes. 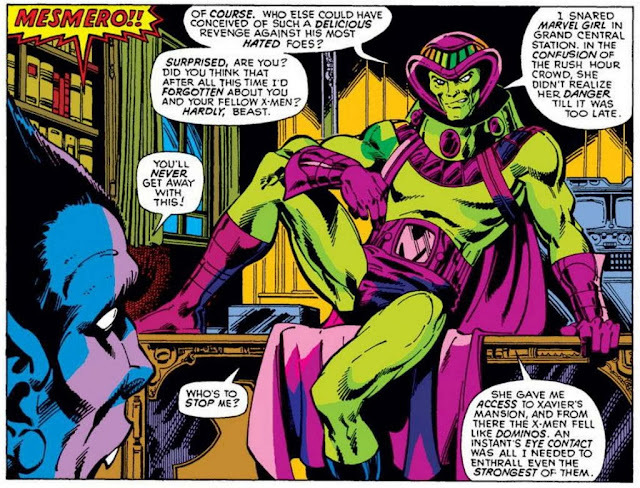 Can’t beat a back-to-back of Mesmero and Magneto. The new X-Men prepare to attack Magneto, who beat them easily the first time they met. Cyclops holds them back from attacking, due to Magneto’s overwhelming confidence and supreme calm. He has Nightcrawler teleport outside, to see what Magneto might be up to. Nightcrawler’s scream sends the team crashing out after him, only to find the wagon floating high above the Earth. Wolverine really wants to gut Magneto, but this time the whole team is on top of him, keeping him from attacking the one person that is keeping them from plummeting ten miles to the ground below (though I believe Phoenix could keep them alive, despite what the dialogue says). 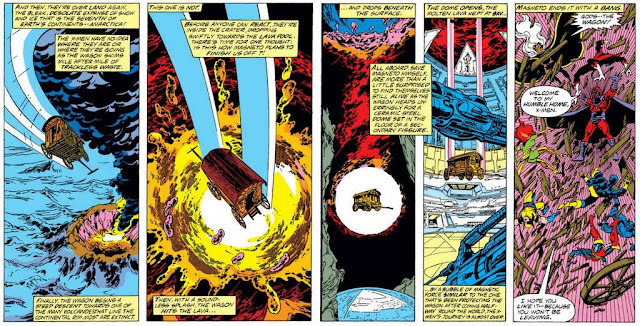 Magneto uses his power to slowly lower Mesmero to the Earth below, much to the surprise of the two fighter jets that were dispatched to investigate the unidentified flying object. They wisely decide to fly back home and get drunk, instead of pursuing the floating wagon. The wagon finally arrives at Magneto’s secret Antarctic base, hidden deep within a live volcano. Immediately upon arrival, Magneto begins his attack. Cyclops begins the counter-assault, but Magneto makes short work of Colossus and Beast. Storm has more success, but not enough, as she’s too afraid to cut loose with the full force of her power. Nightcrawler, Banshee, and Cyclops fall just as easily. 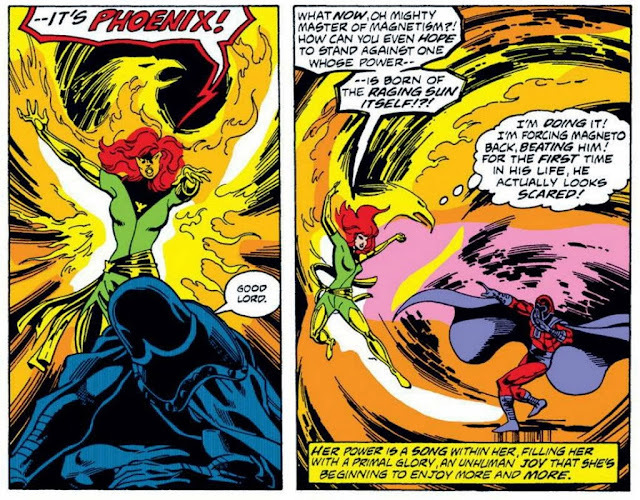 Only Phoenix, who Magneto was completely unaware of, is able to match his power. But even she somehow reaches the limit of her powers, much to her surprise, and Magneto takes her down. 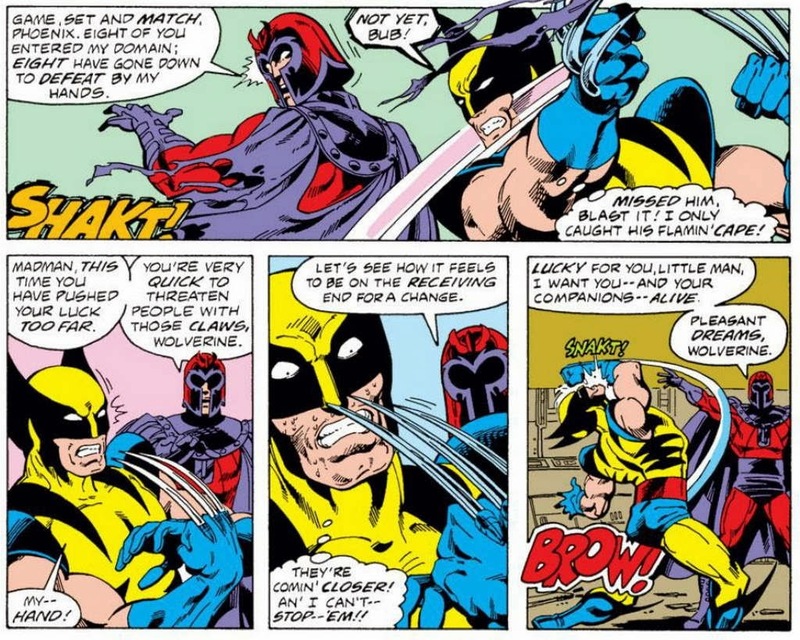 Only Wolverine remains, but his adamantium claws are a serious handicap against the mutant master of magnetism (an interesting happy accident of this new team is that Colossus and Wolverine are practically useless against their greatest enemy). Much later, the X-Men awake, held captive inside weird metal chairs with restraints. 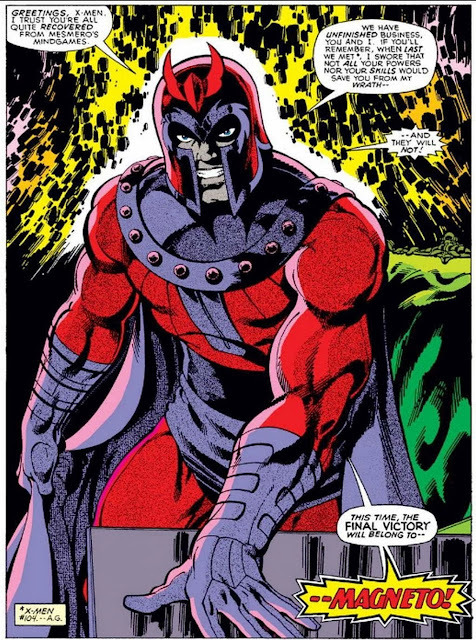 Magneto reveals his ultimate goal. Having been embarrassed by Xavier and Alpha by being reduced to infancy, he’s decided to keep the X-Men captive, unable to access their powers due to the chairs that are locked into their central nervous systems, leaving them as helpless as babies. The X-Men are doomed to live the rest of their days trapped inside a living prison. My brain thoughts: I love irrational villainous plots. My final brain thoughts: The ultimate product of Canadian technology, intense softball, Jean’s garters, Mesmero’s wagon, secret volcano bases, and I really need to get a copy of Champions #16. This is it! This is the reason the X-Men became my third love in comics (Transformers and Spider-Man were the first two, for those keeping track). Like I said before, even with the lower stakes, these battles seemed so much more intense than the previous Cockrum stories. Everything moved at such a breakneck pace in the M’Kraan Crystal Saga (I’m naming it that, even if that’s not what it’s called), and so many explanations needed to happen, that it really needed to be an issue longer for it to have the impact they were looking for (again, the letters pages would disagree with me). Fortunately for my sake, it wasn’t any longer than it was, and I had to read as little of the Starjammers as possible. But now, the stories seem to be paced a little bit better, the threats more personal. We get to delve into these still relatively new characters worlds a little bit deeper, making the threats to them that much more concerning when they pop up. 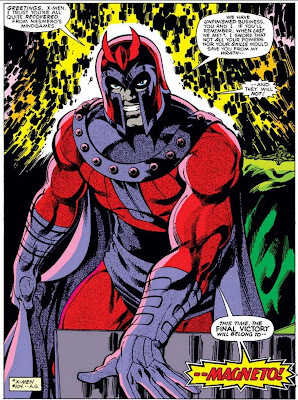 Frankly, it’s probably easier to get more excited about Magneto than it is a second-rate team of Legion analogues. Or this could all be as simple as my blind fanboyism for the majesty of early Marvel Byrne. None of this is meant as a slight to Cockrum, as I think his return to the book post-Byrne was a million times better than his beginning run. Let’s face it, Claremont and Cockrum were unknowingly re-inventing the superhero comic book formula again with their X-Men run, much like Stan and Jack did in the early 60s creating Marvel. It had to be easier to be the next guy in and work off what had already been established, especially when you’re not saddled with two space-based storylines, or Keirrok the Damned. What I can say with certainty, is that everything and everyone involved with the book has only continued to improve as it went on. Claremont and Cockrum, and then Byrne, would only get better as creators the longer they worked on the book. Claremont continues to hone the non-stop forward momentum and neverending serialization that the book would become known for, while still providing satisfying chapters each time out. The characters would continue to get more engaging the more we learn about them, and the more they’re refined by the creators involved. 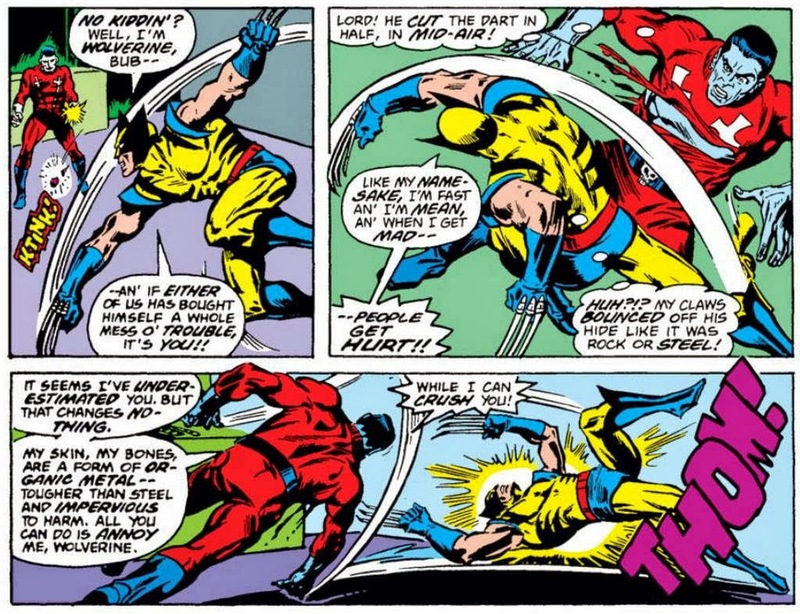 The impact Byrne would have on turning Wolverine into the eventual star character of the book (and for Marvel as a whole) cannot be understated. The plots, and villains, and dangers, and scenarios get better with every issue. That is not a trend that is going to stop anytime soon, so stay tuned. Next time, the world tour begins!